The smallest member of the citrus family, kumquats, like their larger relatives, originated in China. Resembling a tiny oval or round orange, kumquats are the easiest fruit to eat-after a quick rinse, just pop them in your mouth, skin, seeds and all. Kumquats are different from other citrus fruits in that the skin is sweet and the flesh is very tart. Look for firm fruit without blemishes. Kumquats are in season from November through March. Uses include candying and preserves, marmalade and jelly. Kumquats can also be sliced and added to salads. In recent years kumquats have gained popularity as a garnish for cocktail beverages, including the martini as a replacement for the more familiar olive. A kumquat liqueur mixes the fruit with vodka or other clear spirit. Kumquats are also being used by chefs to create a niche for their desserts and are common in European countries. The plant is native to south Asiaand the Asia-Pacific. 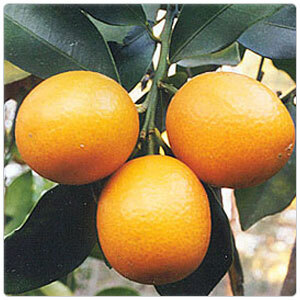 The earliest historical reference to kumquats appears in literature of China in the 12th century. They have long been cultivated in Japan, Taiwan, the Philippines and southeast Asia. They were introduced to Europe in 1846 by Robert Fortune, collector for the London Horticultural Society, and shortly thereafter intoNorth America.